Italian Pack has expanded its skin-pack technology across it’s whole range, for more details click on the document below. Italian Pack has announced new Skin Pack features for models in the Oceania range. Please check the PDF for more details. Click here to download PDF. Synchropack proposes a practical and cost effective solution to label their wrapped packs: it is to integrate a labelling dispensing head in the flowpack, thereby achieving a perfect and accurate position without wrinkles. The method consists in labelling during the film unwinding (when it is perfectly flat and tensioned). The picture shows an integrated solution on a bottom reel flow-wrapper, where dispensing head has been placed under the discharge conveyor and the film unwinding has been extended up to the label dispensing unit. Additionally, Synchropack integrates the electrical control of the labeller into the cabinet of the flow-wrapper using the same driver and the same touch screen, so that it can memorise the corresponding parameters of speed and position for each recipe or format. SynchroGroup has recently supplied a 600 LTS Flow Pack “L” model to one of the largest European manufacturer of dry noodles in multipack bundles of single-serve noodle packs, from 3 to 20 individual packs. a double chain conveyor with rods, where single packs of noodles are manually fed. side gusset mechanical folders on the transversal sealing prior to closing the sealing jaws, achieving a final very compact presentation of the secondary pack. Once more, SynchroGroup confirms its capacity to invest in new technologies and bring innovative solutions to the world of packaging. SynchroGroup offers the possibility to offer all messages of the operator touch screen in several languages, in addition to those already included by default settings (Spanish, English and French). Using HMI screen in the local language allows operator-machine interaction in a much more user-friendly way, thus obtaining accurate and rapid interpretation of messages, preventing errors and minimising time for adjustments, format changeover or troubleshooting. For better results, we share translations with the client before the final delivery. We have already customised screens in the following languages: German, Finnish, Dutch, Hebrew, Italian, Lithuanian, Polish, Portuguese, Russian and Swedish. If you have any question about this service, please contact us and we will answer your request as soon as possible. SynchroGroup has supplied to an important multinational company a semi-automatic line for loading and packaging biscuits of different shapes (round, square and rectangular) in slugs from 200 to 250 grams. The supply consists on a double chain conveyor with rods on which cookies are manually loaded, a 90º transfer to introduce them into the Flow-Pack pusher´s conveyor and the Flow-wrapper itself. Synchrofeed has developed a new 90 °transfer with tracking function of the wrapper chain (equipped with 3 servomotors) to obtain a very soft and gentle transfer of the slugs, avoiding sudden movements that may damage or even break fragile or sensitive cookies. Synchropack has introduced a new concept of “universal” side belts to accompany and hold the biscuits on edge position once introduced into the film tube. This solution, allows easy and simple format changes in the slug/bag length without needing to change the side belts. 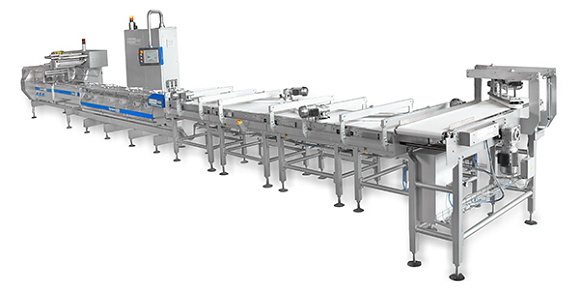 SynchroGroup has supplied to an important Australian manufacturer a fully automatic Flow-packaging line for wrapping different types of filled fruit bars, up to 320 units per minute. The aim of this Project is to collect the product that randomly arrives from a cooling tunnel, getting it aligned longitudinally, accumulated, synchronized and individually flow-wrapped, at high speed. The line allows a lot of flexibility and ease format changing. The entire system is aimed, designed and constructed to facilitate both the dismantling and cleaning tasks that must be performed very often, due to the nature and characteristics of the product. Dismount and mount operations for cleaning purposes can be performed almost without using any tool. SynchroGroup has provided to a major French veterinarian group a semi-automatic packaging line for multi-packs of medical syringes, in several formats. The system is composed of: a special roller conveyor for manual loading of syringes, a labeling station with an upper conveyor for flattening & rolling of the label around the syringes, an ABB IRB 360 spider type robot for pick & place purposes and a Pack 60 LTS Flow-wrapper (bottom reel type) for wrapping and hermetic pack sealing. At the end of the line, there’s also a counting and pre-grouping conveyor, to facilitate the manual case packing operation. The line is provided with sensors to detect and automatically reject unlabeled products as well as an inspection camera system which controls the correct amount of syringes on each pack as well as if they are well positioned as regards the film printing in order to avoid possible blockings on the cross seal area. As per any pharma project, the whole line has been delivered with the related IQ/OQ documentation protocols. The challenge of this project was to develop a special conveyor for feeding 2 different shaped products to the wrapping machine without needing any change part and to ensure a correct positioning and stability of the syringes along the process, something difficult to achieve due to the big differences on their shapes & sizes. ItalianPack have introduced their new Automatic Belt Vacuum Packaging Machine the ATLANTIS AUTOMATIC 1000.